0.1 gfx_directx: IDirect3DDevice9 object created as hardware device. 0.1 gfx_directx: D3DXSaveSurfaceToFile() successfully loaded. Mouse pixel positions are incorrect with gfx_sdl2. I've seen this before in other applications, it doesn't account for the stretch like it does when windowed. So in one sense, it is super accurate to the actual display, but not in the logically desired way to the game's base resolution. My video driver crash: I started with using the nightly. Then I switched to the link for sdl2 you provided. This is when any resolution setting besides 320 would do this when running it through custom or game.exe: the window would appear, windows would freeze for a few seconds, screen would go black and then windows would inform me the video driver shut down and had to restart, and then it would stall again, finally asking to send a bug report. I have no clue what the video driver crash was caused by, but I place blame on nVidia for that. You have an nVidia GPU, right? I'll take any excuse to diss nVidia, because I hate their Linux drivers. Of course, it was probably triggered by trying to do something weird and invalid on our end. The gfx_sdl2 code to do with resolution is so far from finished that I'm [amazed it works at all and] expect the crash will simply disappear once it is finished. Ditto the mouse positioning. My plan for the nearterm is to finally implement variable resolution support in gfx_directx. Wait, so both gfx_sdl2 and the default gfx_sdl don't show the whole image in fullscreen when the resolution is higher than 640x360 (or at least not 720 wide), is that right? Did they both cut off the image in the same way? That's really weird that they behave the same since SDL and SDL2 handle fullscreening very differently ... maybe there's something I copy-pasted from gfx_sdl to gfx_sdl2 that's bad (but most of that stuff is different). Working on something. Sometimes people make loose remarks on discord or elsewhere and I get motivated. Probably won't be done for Fufluns. Or maybe I should say Fufluns won't be done in time. Oh, my! That rotation looks really good! Oh you're all just traumatised by 20 years of being told "No"! Turns out that rotating sprites is pretty fast, even on a CPU and generating non-SIMD code that will run on a 486 (as we do), if you just use the simplest implementation which does no filtering. I don't have a terribly new or fast CPU, but can draw 20 rotated 320x200 backdrops and still hit 60fps. In other words, this should have been added long, long ago. So what's interesting is to have an option for slower (we're talking 10x or more) zooming/rotating which does some filtering. But bi-linear is pretty poor when shrinking heavily rather than expanding images, that's one reason GPUs use minimapped textures. SDL_gfx doesn't have any kind filtering for 8-bit rotozoom, so I'm going to implement one myself. Namely, a variant on the well-known RotSprite, but faster. 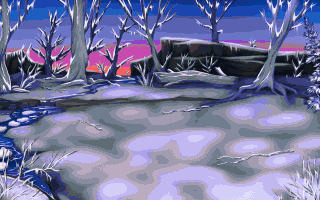 I think I'll have three rotozoom quality levels - the max level can be used in the sprite editor and when you're not rotating a whole backdrop. Also looks like I need to do more work on the gif encoder, it generated huge gifs in 32-bit mode; I made these with gifsicle instead. But actually, I'll been working on squashing bugs today. Charbile: could you respond to this? I see that it crashes outright while trying to show an error message, at least for me. Didn't you see the crash handler pop up when it crashed? Not shown: all the bugs. Lots of missing bits too. Ugh, this will *definitely* not be in Fufluns. Besides, I really need to implement a better rotation/scaling algorithm, otherwise the results are so poor (as you can see) that the convenience of not needing an external program may not make up for it. I've been thinking in detail about it and believe I can improve on RotSprite, because there appears to be a logical error in its design which I know how to fix. Also, RotSprite isn't designed for high zoom levels anyway. Dang, that is so cool! I would get a lot of use out of that feature. Will it also work on mark/clone selections? I haven't implemented transforming clone selections, but I will. I also haven't add mouse controls - I wanted sub-pixel control, like the ellipse tool. Plenty of work has already gone into cleaning up the sprite and tile editor code over the years, so overall it's not so bad, but the UI code never got any attention. I'd want to refactor the tools to OO-style, so all the code for each tool goes in one place, and put in a decent abstraction layer for defining buttons and controls. 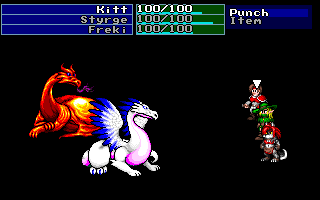 I now definitely don't want to try to implement 256-color sprites without first cleaning up the UI code. A) what happens when running gfx_sdl2 with ohr set to 1280x720 -- is this the crash handler you mean? Yikes, it's been a few weeks since I gave an update here. I've been a bit more focused on finishing Fufluns, but still many distractions. There are still ~25 new-in-nightlies bugs unfixed. -Fixed all the gfx_sdl2 bugs Charbile reported. I'm not aware of any more significant gfx_sdl2 bugs, so it's probably usable on Windows, GNU/Linux and Unix now. (No Mac build yet.) In future (not Fufluns) it'll become the default. I'm terrible at timely updates. SwordPlay picked up the source code and has been playing around with it, which I'm really pleased to see; I've been giving him guidance. He compiled the OHRRPGCE for his Raspberry Pi; that hasn't been done in years. Now that it's not just me, we have an #engine_dev channel in the SS Discord server. The first thing he's done is implement hero MP meters! there are new UI colors. The meters are disabled by default in existing games. He's also been experimenting with modifying some builtin menus for low resolutions. 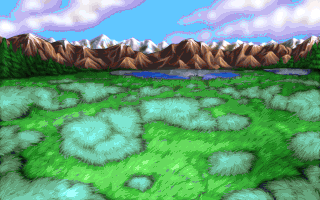 -I realised that the option to dither an image when importing (new in nightlies since a year ago) was using a very bad color distance metric, and that's why it produced such poor results. -Transparent rect slices. These aren't actually used anywhere yet (but here's a preview of what it might look like). 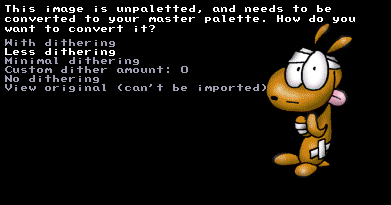 Works by doing a nearest-color search of the master palette, so it doesn't look very good if you do a fade. Maybe if I used dithering? 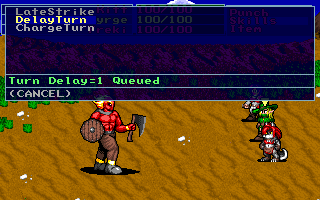 -Added "Camera following a hero/NPC centers on: tile/sprite/sprite minus Z" setting. A few people have complained that when using larger walkabouts, switching from "camera follows hero" to "focus camera" or other tile/pixel based camera-centered caused the camera to jump. This fixes that. -Little progress on Fufluns :( I thought it would be released last month. Surely this month?